Have You Backed Up Your Smartphone Snaps? 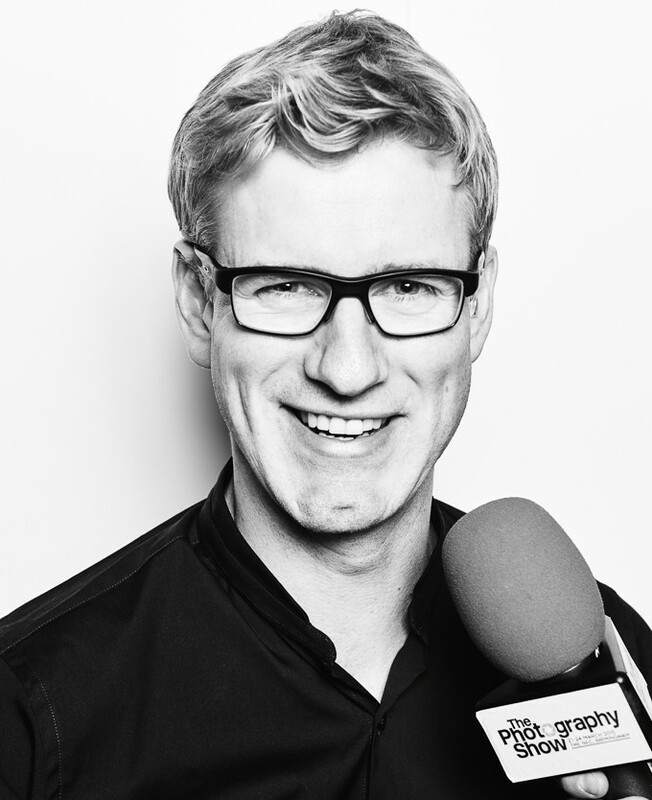 Earlier this week I appeared on BBC Radio 4 consumer affairs show You and Yours to talk about how to keep your smartphone photos and videos safe and secure. Following a post on the BBC CBeebies Facebook page, a disturbing number of parents reported pictures had been lost through theft, accident or a broken device. I say ‘pictures’, but often these are precious, irreplaceable family memories. Estimates suggest we shared one trillion pictures from our phones in 2014. When smartphone photography is so simple that it requires almost no thought, it’s easy to take the snaps we take for granted. But that becomes a big problem if when phone begins to run out of storage space, or worse if it gets lost or stolen. Fortunately, there are many easy ways to back up your photos and keep them safe. The simplest backup of all is to store them in ‘the cloud’, what I often describe as a giant USB stick somewhere on the Internet. Both of the major phone families – iOS found on Apple’s iPhone and Android installed on Samsung, Sony and HTC handsets among others – provide methods to back up your settings and app data along with photos and videos. Apps such as Dropbox (and now Carousel), Flickr and Microsoft OneDrive provide seamless background image copy; Google Photos offers unlimited free cloud storage for images up to 16 MP and videos up to FullHD 1080p, more than satisfactory for most smartphone users. With any cloud storage security is paramount (as some celebs found to their embarrassment recently) so ensure you understand any terms, use secure passwords and two factor authentication where available. If you want to find out more about securing smartphone photos and videos drop me a line or leave a comment below. This article first appeared in Computer Weekly in July 2014, find the original feature here. 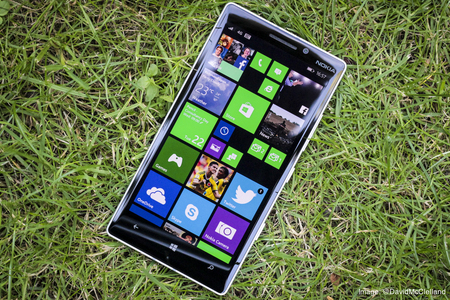 The Nokia Lumia 930 is a substantial handset in more ways than one. First up, the body: Nokia has adopted a sturdy aluminium unibody for its latest flagship, but has still chosen to decorate its back with the signature polycarbonate – neon green and orange get the Lumia treatment this season, with white and black completing line-up. 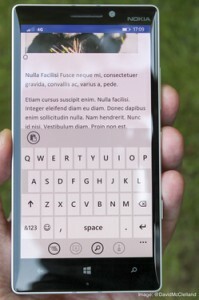 The Lumia 930’s Full HD 5-inch OLED screen is striking too: blacks are black, colours pop and despite the high-gloss it repels greasy fingermarks well, remaining readable even in direct sunlight. The bezel is narrow enough, and the curved edges of the scratch-resistant Gorilla Glass 3 screen lap onto the handset’s chassis, mirroring the contours on the rear. 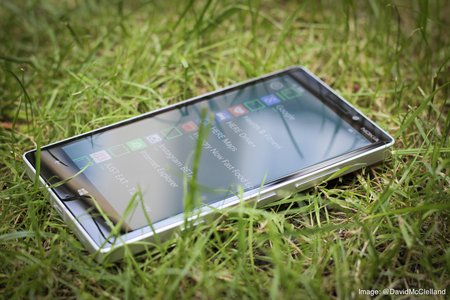 The volume rocker, power and camera shutter buttons all sit along one side of the handset. This keeps the aesthetic clean but means that securing the 930 into most after-market car kits will result in one or more buttons being permanently depressed. Form 1, Function 0. Beneath the vibrant exterior sits a quad-core 2.2 GHz Qualcomm Snapdragon 800 chipset, 2 GB RAM and 32 GB storage. While the CPU is last-year’s model it’s certainly no slouch. Despite the missing MicroSD card slot Microsoft now bundles 15 GB of OneDrivecloud storage for free, and 1 TB if you’ve an Office 365 account. As with other unibody handsets the 930’s battery isn’t removable, although I found the 2420 mAh unit lasted through the day. Having toyed with wireless charging on the Lumia 920, Nokia once again integrates the feature and this time includes an induction charger in the retail box. Disappointingly, I found it a bit flaky. On more than one occasion I left the handset atop the charger to find it hadn’t charged the phone. Software bugs need to be ironed out too, with the 930 insisting it was still charging hours after its removal from the charger. Wireless charging is seen as a panacea by some but until reliability is improved many might still prefer the reassurance of a cable over the questionable convenience of a mat. Also worth pointing out is that the chassis can get very, very hot on charge or in use. The Lumia 930 features a terrific 20-megapixel PureView camera which makes shallow depth of field shots look natural without any clunky software processing. 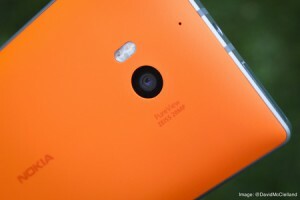 Optical image stabilisation, ZEISS 6-lens optics, dual-LED flash and lossless zoom top out the specs, but again the Lumia’s screen steals the show, making pictures pop like a print. Windows Phone 8.1 is the newest version of Microsoft’s mobile operating system introducing features which many hoped might bring it in line with its competitors. Action Centre apes the notification bars seen in Android and iOS. A swipe from the top of the screen recalls missed messages, a customisable quick menu and a shortcut to the phone’s main settings. A welcome addition to the operating system. Swipe-style typing also debuts and, once you’ve the hang of it, is very accurate. 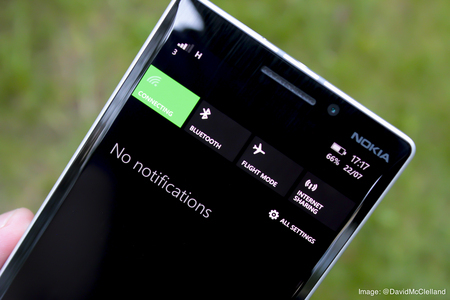 However, Cortana, Windows Phone’s answer to Siri, hasn’t made it onto UK handsets yet – expect to see it (her?) on Windows Phones by the end of the year. For many email will be a main driver and Microsoft makes setting up accounts simple. I didn’t get the chance to try the 930 with an Exchange mailbox, but it handled multiple outlook.com, IMAP, Gmail and POP mailboxes with aplomb. Windows Phone 8 also does some useful things around the concept of the unified inbox. Instead of a single inbox encompassing all configured accounts, individual email accounts can be grouped or ‘linked’ together. This makes it possible to combine work email addresses into one unified inbox and personal accounts into another, each accessible through its own live tile. The bundled Bing News and Bing Sport apps are intuitive and well designed pulling news from a variety of credible sources. Fundamentally, for a news app to succeed it needs to leave me feeling as if I’ve caught up – these do exactly that, with style, and allow custom feeds too. Microsoft Office connects you with documents stored on your OneDrive or Office 365 cloud as well as with email attachments. Excel, Powerpoint and Word are well executed apps, although losing what feels like two-thirds of the display to the over-sized on-screen keyboard is a shame. Microsoft’s spartan UI works hard to differentiate itself from its identikit competitors and, in general, it works well. However, for the sake of productivity I’d prefer to see more actual content on the screen. A case in point is the official Twitter app – even with the smallest font I can see no more than three or four tweets per screen; similarly, the email app reveals up to six messages before scrolling. At 5 inches and 1920 vertical pixels there’s a lot of screen real estate on the Lumia but the important apps just don’t seem to fill enough of it. Despite the ’80s-styling on the rear the Nokia Lumia 930 is Windows Phone’s most mature handset to date. Its productivity credentials are top notch, and OS integration with Microsoft cloud apps and services mean it’s a capable business workhorse as well as a fun down-time device. All the Windows Phone ecosystem needs now is more apps, and with high-quality handsets such as this they’ll be sure to follow. First published 22nd July 2014 in Computer Weekly. Articles, features and reviews are reproduced on this site by prior arrangement as samples of my work and remain the property of their respective publishers. 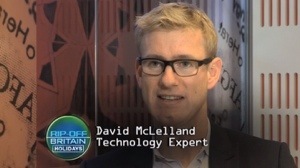 Written by David McClelland for o2.co.uk’s The Blue, find the original post here. 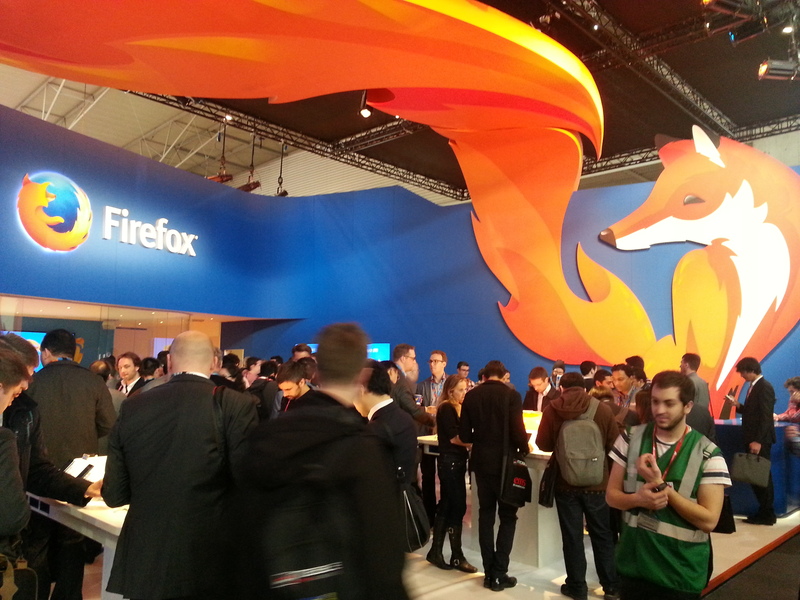 Mobile World Congress 2014 has been abuzz with talk of the $25 Firefox Phone, but just what is it and who will want one? Many will know Mozilla Firefox as a popular and powerful open-source web browser for PC, Mac and Android smartphones. With more of what we do every day taking place through the web — email, word processing and even gaming — it stands to reason that a web browser on its own might make a solid platform for an operating system. Just ask Google, whose Chromebook laptops run nothing more than the Google Chrome web browser yet accounted for 2 of the 3 best selling laptops at Amazon last Christmas and 20% of all notebooks sold in the US last year. Firefox OS then is a fully-featured free operating system for mobile phones, tablets and even televisions complete with its own app store. At Mobile World Congress this year there were several announcements from Mozilla, the not-for-profit organisation which develops Firefox, including availability of 7 new handsets running the Firefox OS. At the moment the operating system is predominantly used in smartphones destined for developing markets such as India and Africa, seen as a potential upgrade path from the less-functional ‘feature phones’. Aside from the commercial lure for handset manufacturers to expand their business into countries not already saturated by smartphones, affordable devices such as those running Firefox OS can be enablers for individuals, providing easier access to online resources such as banking, learning and retail. Among the new handsets announced this week is the ZTE Open II. A budget smartphone running the latest version 1.3 of Firefox OS it sports a 3.5-inch display, 1.2 GHz dual core processor, 2 megapixel camera and 256 MB of storage. Paltry specifications in comparison even to low end smartphones in maturer markets but, at the right price, it’s an affordable and attractive upgrade from a candy bar feature phone in many countries. 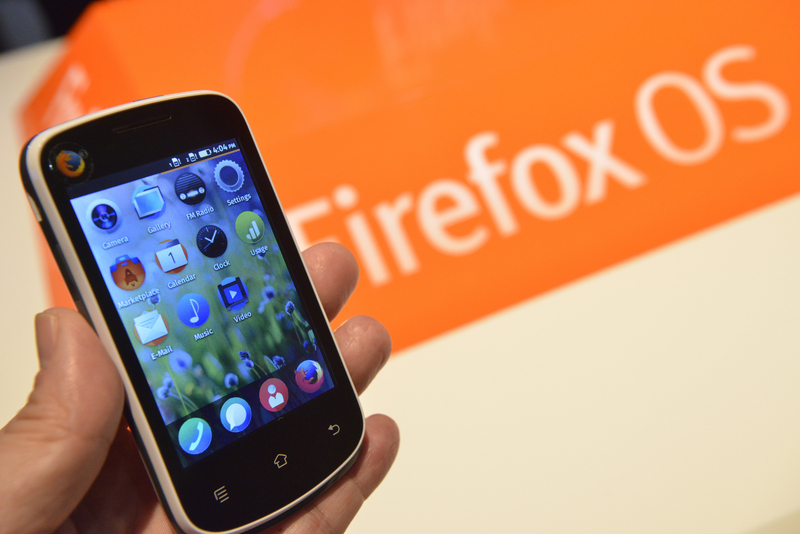 The so-called $25 Firefox Phone unveiled this week is another developing market device, although it won’t be available quite yet. Mozilla has, in collaboration with a mobile chipset supplier Spreadtrum, shown a prototype handset which it claims manufacturers will be able to build and retail for as little as $25. That’s right, just £15 for a smartphone. Again, the specifications aren’t great — on your 15 quid phone you won’t even be able to download data over 3G networks, but as a relative experience it’s significantly better than the handsets they’re set to replace. First published 27th February 2014 on 02.co.uk. Articles, features and reviews are reproduced on this site by prior arrangement as samples of my work and remain the property of their respective publishers. 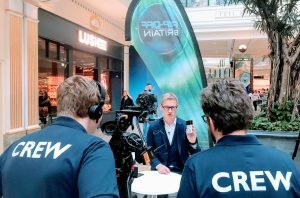 For the last two series of BBC One’s Consumer Affairs show Rip Off Britain I’ve appeared as the Telecoms and Technology Expert primarily offering hints and advice to the millions of mobile phone users in the UK. This week sees the second season of its successful spin-off show, Rip Off Britain: Holidays, and once again I’m delighted to be on hand to help. With Britain in the grip of one of the wettest and windiest winters in a generation our thoughts naturally turn to an escape abroad to warmer and sunnier climes. However, in an increasingly connected society, among the challenges of travelling abroad is how safely to use your mobile phone without getting a nasty surprise from an unexpectedly large bill upon your return home – so-called ‘bill shock’. 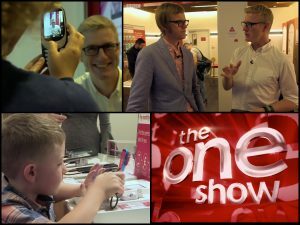 This is just a short iPlayer excerpt from a longer item, to see the full shows visit the Rip Off Britain website. The BBC has also published a downloadable guide featuring my handy hints for taking your mobile abroad which you can download here. Rip Off Britain: Holidays broadcasts on BBC One at 11am each day from Monday 6th to Friday 10th January 2014, repeated the following weekday on BBC Two at 7am.